I am preparing this statement because my short-term memory loss makes it tricky for me to present a complex train of thought without interruption. I've taken days to write this, but if it will get across to you an accurate understanding of my situation, it will have been worth it. In January, 2011, I was bit by something—probably a spider—in bed. I thought nothing of it at the time. Two days later, I came down sick with what I thought was the flu. The next day I was in the hospital, and the next day, I was in a coma. When I came out of it a day later, I woke to find all the skin and half the fascia (the layer between the skin and muscle) gone from my lower left leg, and a gaping wound from the knee to my groin. I was told I had beat a mere 20% chance of survival. 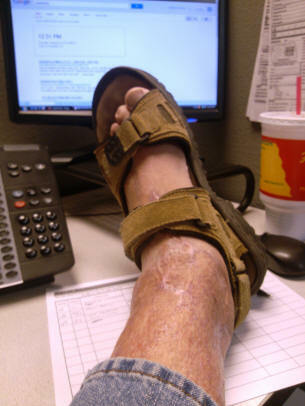 The diagnosis was necrotizing fasciitis, popularly known as "flesh-eating bacteria." I underwent a series of painful operations to graft healthy skin from my upper legs to the skinless lower left leg. Every day was agony, made slightly less unbearable with heavy doses of the painkiller dilaudid, and the anti-anxiety medicine, ativan. I was in the hospital for months—you have the exact dates in the paperwork from the hospital—and when I was released, I still had a PICC line for a daily antibiotic drip, and I was attached to a device called a wound vac. I was instructed to keep my leg higher than my heart for as much of the day as possible. I was able to perform simple chores such as laundry and running the dishwasher, but no more than that. Friends recommended I apply for Social Security Disability "just in case" and I did so, not really expecting that I wouldn't have another job before it ever came through. After all, sick and wounded as I was, I still didn't have the mindset that I was "disabled." I felt like it was a temporary setback that I would soon overcome. Consequently I kept trying to do "normal" things, starting with getting another job. The problem was, even more than crying during phone interviews and forgetting what we were talking about, that I could not remain upright more than a couple hours without my left ankle swelling and becoming excruciatingly painful. 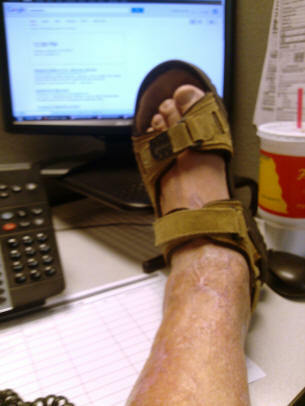 The swelling and pain could only be alleviated by putting my leg up higher than my heart, a position no employer could envision accommodating in the workplace. I also tried doing the things I love, like hiking and swimming. Both attempts were disastrous. The grafted skin on my leg has never grown to be as supple as "normal" skin; and my immune system hasn't recovered. My lower left leg has no sense of feeling, so that I can brush against a normally innocuous object, sych as a rock, bush, or chair, not realize it, and find myself with an open cut that quickly gets infected. It took four more hospital stays, complete with more antibiotics, dilaudid and ativan, before I finally realized I really couldn't do those things ever again…at least, not without risking my life. Now it's 22 months later, and the situation hasn't changed. My ankle still starts swelling after I've gotten up, and I have to lie down with my leg higher than my heart for an amount of time equal to how long I was up, for the swelling and pain to subside. The pain isn't just annoying, it's mind-numbing and prevents me from thinking clearly, even beyond the lingering effects of the ativan. If I take strong drugs (such as Percocet), the pain eases somewhat but then I can't think at all. So the only real solution, which I've employed for the past year, is to carefully time my activities so I get up, do what I have to do, then lie back down—leg higher than my heart—for the same amount of time. The most I can stay up without severe pain is just under four hours. And it doesn't matter whether I am standing or sitting, or, for that matter, riding a bike or watching TV. It's up for four hours, then down for four hours…and by then, the pain is severe enough that I can't even read. I just breathe and try to meditate until it passes. Of the four issues I have that make me unable to work, only the memory loss/mood swings are invisible. Several years ago I tore my right bicep tendon, which you can see. This has weakened my right arm to about 30% of its former strength. This never interfered with computer programming, but eliminates truck driving, factory work, and similar physical jobs. (After 9/11, I spent a year driving truck since there were no programming jobs available.) The thin skin on my leg is easy to see and feel, and a basic understanding of the mechanism of infections will make it obvious why I must maintain constant wariness to make up for having no feeling to warn me of impending danger. And, finally, while the pain in my ankle can't be seen, the swelling can be seen and measured. I have worked all my life, My first paying job came when I was 14; the summer I was 18 I had three part time jobs at once. I have often worked two or even three jobs at the same time. In the seventies, I had a full-0time job, two part-time jobs, and carried 19 credit hours at my local community college (and was on the Dean's List). When people used to ask me what my retirement plans were, I would joke that I intended to go camping in Canada and annoy a grizzly. See, I never intended to retire at all. I have always loved my job, and being with the friends I made at my work. I loved being good at what I did. And through all that, I paid my Social Security taxes knowing that, if I ever couldn't work, I would have that to fall back on,. It is, after all, supposed to be an insurance policy. According to the rules, if my condition persists for 12 months, I am eligible for disability. Well, it's been 22 months and my improvement has long since plateaued. Meanwhile, while waiting for the disability to come through, I've lost my house, my car, and am now living with friends whose patience is surely wearing thin. I feel certain, your honor, that if your auto insurance resisted paying you with the dedication Social Security has resisted paying me, that you would be at least as frustrated as I am. All I am asking is what I have paid for during 45 years of being a contributing member of society. All I am asking is that you acknowledge what is materially visible to you, your honor, should you simply look at my leg and ankle. I am only asking for what I've paid for and am entitled to. With disability payments, I can stop being a burden on my friends and society and maybe even get a little more enjoyment out of my life and grandchildren in the time I have left to me.